I want to talk about dreams. Not the kind that you have while you sleep. Did you had dreams while being a child? What did you wanted to do in life? Have you succeeded at all or are you doing now something completely different? Would you change anything if you'd have another chance? You can still help people, even if you're not a Christian anymore. You don't have to be a missionary. There is voluntary work, and some professions by which you can help other people. Only the name of your profession has to change, not your goal too (if your goal was to help people, and not indoctrinate them). Life does not come the way I planned for. I dreamed to be a doctor but instead, I studied nutrition. What stopped you from becoming a doctor? I did not get a chance to be accepted into the faculty of medicine. In the year 2001, opportunities were very few at that time. Was it hard to leave all behind to pursue your dream? That's the most difficult part for me, and I don't think I'll ever be able to do it, even if, overall, I don't have a great relationship with my family. When I was young, I was really good at basketball. I got scholarships to play for the state team and go to college when I got old enough. I couldn't really play for anyone else near,by so I quit. I picked up guitar and started carrying a sketchbook everywhere. I'm now in my last year for my BA in animation. I love art. I don't regret giving up basketball and taking up the pencil. I'm actually glad it turned out the way it did. I wanted to be an astronaut. But I'm too fat. They don't let fat people in space. I was informed of this at 11. I wanted to be in theatre or dance for a long time. But theatres and dance companies don't like fat people. I learned this at age 14, that they won't even hire you if you don't exude that youth and sexualized image. Around 16, I started writing. I have been ever since. I don't feel like I have my own 'style', yet, I feel like I'm still copying. I hate writing poetry and avoid it at all costs, I'm a natural storyteller, and I love constructing vast universes to play in. I've come up with several video game ideas, specifically aimed at girls who are very literary, in the vein of Bioshock and The Path, focusing more on discovery and knowledge, kindness and growing, rather than violence, which most popular ones are all about. I dislike violence most of the time. At 18, I wanted to go into chemistry. For the Money. I was told I was smart enough to do it, but my heart was never in it. I took one semester of it and switched to Anthropology. Around 19-20, I was hoping to go into working for a museum. Right now, at 21(I'm turning 22 in March), I'm not sure what my life will end up looking like. I have a good work ethic, but I'm almost paralyzed with fear, at the thought of applying for jobs, and being turned down outright due to my size. I love clothes, I would love to do costuming for theatre, I would love to do set design or set building(I know a lot about odd jobs and house repair, my father is in construction and has no boys, so as the oldest I got to do all the jobs while he supervised and told me what to do), I would love to travel the world, I love to cook, I'm very good at it, especially when it comes to cobbling together a meal from odd ingredients. I love writing, though, I enjoy constructing stories in any form. I plan on writing a play for the final project I have in Blount. I am an artist, as much as I hate the snobbery attached to the form. Currently I am looking at going back to school online somewhere to get a basic degree in Computer Sciences. I'm decent with computers, I understand coding---I am just very lazy. I see no reason to work for 5 hours on something I can generate in 20 minutes otherwise. My usual preference is to work smarter, not harder--which tends to be a problem in "schooling", where they usually prefer for you to work harder, longer, faster, but not get too much more work done. I could always start my own cult. That'd be a hoot. I'm just going to ask it straight away... Why are you fat? This must be the most detailed post on this discussion so far. 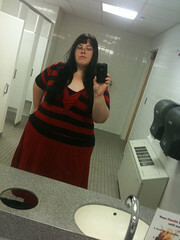 And this is in clothes that are rather slimming on me to begin with. I have had this fact drilled into me since I was young, and I have always been "large" for my age. I currently weigh something like 320-something, but I haven't weighed myself in forever. 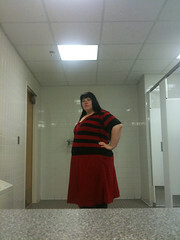 I'm a size 26 on bottom, which is loose-ish(I hate tight clothing), and more like a 20 up top. It occurs to me you could be asking "how I got to be fat"
I just--am fat. That's how it is. I cook for myself. I eat veggies. I walk all the time. I can jog up several flights of stairs easily. I've always been fat, I've been on numerous diets and the only thing that 'worked' was near-anorexia(I wouldn't eat in high school, then I would come home and exercise for 2 hours with freeweights, the only meal of the day was the dinner my mom cooked, if she cooked at all), and that got me to a size 20 from a size 24, already cusping on a size 26. And I gained it all back when I started eating again. I quit diets a few years back, and obviously I may be -fatter-, but I feel -better- physically. Some people are just fat. If you want articles or links and scientific data, I can totally give you some but this place isn't the place to discuss it(I have no wish to threadjack). It seems to me that the natural leader types with brains tend to be of the larger variety. I have two friends in particular in mind when thinking of this and they are some of the most awesome people i know. I find that looking slim often leads people to be channeled into a style of life that's effectively template based. They get pampered thanks to their looks and often don't develop much personality. Ever thought of opera? Size need not be an issue there so much, it would be similar to your 14 year old ambitions... But I'm still all for the cult idea. I find that looking slim often leads people to be channeled into a style of life that's effectively template based. They get pampered thanks to their looks and often don't develop much personality. And if you -ever- suggest it to them that they got ahead with something other than brains, they will get super-offended and upset. This has happened more than once to me. But people don't quite realize how much looks affect how everyone treats you, and as well, how you treat everyone else. My personality is "quirky" at best. I tend to be nicer than I should be to people, and will often keep my mouth shut when I'm unhappy with something to try to keep the peace. Opera....hrm. I'm a half-decent singer, but I've never really looked into it. I don't know how popular it is or isn't, the only foreign languages I know are snippets of Japanese(hoo boy I'm a nerd) and currently am studying Spanish. Usually you need to know Italian--but I learn fast. The Cult idea is born of the fascination I have with cults. I've done a ton of research on them, outside of University classes and such where I've focused on things like health and social underpinnings--the human wish to be 'special', the small hunter-gatherer bands, the ability to turn everything over to someone else who makes decisions, the way humans are gullible and prone to coercion, especially from attractive or well-spoken people. And then the really creepy-awesome side effects, like a lack of sickness and the effect cults have on brain patterns. Cults are normal religion and status markers, turned up to freaking 11, they give me the creeps, but as well, they are kind of an odd little facet of humanity. You can also have cults centering around science, rather than religion. Religious ones just get the most press.